Coming in January! 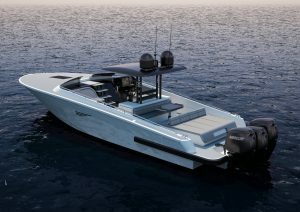 The 2018 Canados Gladiator 428 : Atlantic Yacht & Ship, Inc.
Coming in January!!! This pedigree Italian designed 2018 Canados Gladiator 428 is making her U.S. debut at the 2018 Miami Yacht Show. The ultimate day-cruiser has a cruising speed of 45 miles per hour and a max speed of 57 miles per hour. A garage for Seabobs is hidden underneath large aft walk-around sun pads. The dining area and lounge sofas make a comfortable social area for friends and family. As well as, two lounge-sofas positioned at the helm area allowing the captain to enjoy company while navigating. Furthermore, the 42’ Canados Gladiator has powerful bow thrusters and joystick control making maneuverability and docking a breeze. With a wide beam, the cabin and head below are spacious and roomy. Additionally, custom color options for the hull, deck, cockpit furniture and external upholstery are available. As a custom yacht builder, Canados offers clients the ability to design the yacht of their dreams. With this in mind, let Atlantic Yacht and Ship make it a reality. For more information on the 42’ Canados Gladiator, contact Stephen Faraldo today at Atlantic Yacht and Ship!